Meadowhead School - Media & Marketing Competition Success! Media & Marketing Competition Success! Young Sheffield Entrepreneur embraces the ‘Big Challenge’ with award winning media and marketing campaign! 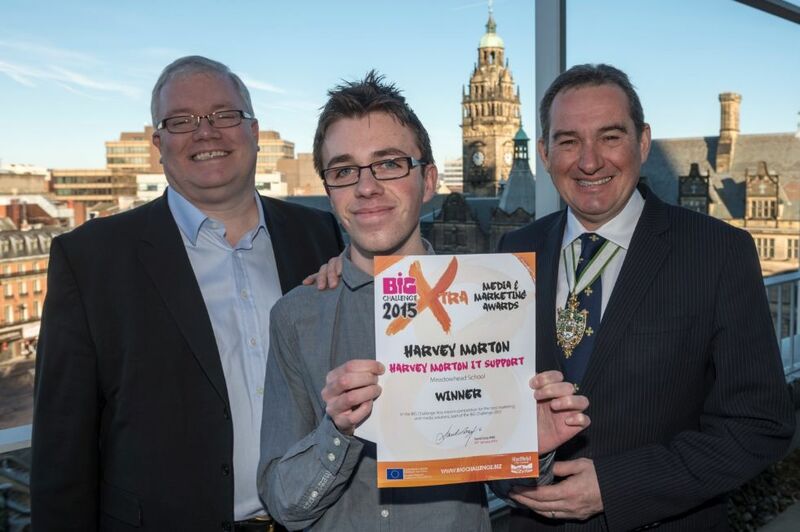 Harvey Morton, one of our sixth form students and entrepreneur beat off competition from 5 other business teams to scoop 1st prize in the interim citywide enterprise competition, ‘The BiG Challenge’ on Monday 9th February 2015. The BiG Challenge is part of the BiG Enterprise Programme and is funded through Sheffield City Council and the European Regional Development Fund. The 2014/2015 BiG Challenge is organised by a steering group chaired by David Grey, Group MD of OSL Group Holdings Ltd. This is the 4th year running that Harvey has entered the competition which is sponsored by various local companies, including Sheffield based law firm DLA Piper, and whose aim is to encourage the next generation of Sheffield bred entrepreneurs by encouraging Sheffield schools to support teams to create and run a small business for 6 months of the academic year on a £25 start-up loan. Harvey started trading in October 2011 with a small team making and selling key-rings and greetings cards, but soon realised he could put his IT knowledge and experience to better use and established his winning company ‘Harvey Morton IT support’ in September 2013, offering to help any individual with their IT problems in the home. “I am both surprised and delighted to win first prize in this interim competition and I am now determined to get to the finals in March to have a chance of winning further prizes including the BIG trip to Rome for the overall winner this year” stated Harvey.